The use of estrous scents can be most effective during the same time deer scrape hunting is best – the pre-rut and early stages of the rut. Do you remember when you first encountered a whitetail scrape while deer hunting? One hunter was on a trip to Alberta, and this particular area was scraped up like a barnyard. He thought he had found the proverbial pot of gold at the end of rainbow, so he sat on top of that spot for a week. Except for some squirrels and a few songbirds, he was pretty lonely. Of course today hunters know so much more about deer scrapes and scraping behavior than they did back then. Biologists have dedicated years to monitoring and studying scrapes, how and why they are made, and what they mean in the overall social hierarchy of a deer herd. Smart deer hunters have, in turn, begun using this research to help them plan their own hunting strategies. Your own scrape hunting strategy should begin with a basic understanding of what the latest research tells us. The first major deer scrape study was done by a biologist and based on a penned deer herd at the University of Georgia, the results being published soon thereafter. The doctor found that here dominant bucks did most of the scraping, and that while subordinate bucks might mark and lick the overhanging “licking branch” they rarely pawed or peed in the scrape itself. The deer were only observed during the day in this study. This was primitive research, of course, but set the ball in motion. What really changed our knowledge of deer scraping was the introduction of the motion sensor still and video cameras. Now scrapes could be monitored 24/7, both on captive and wild deer herds. This information has changed everything. Making a mock scrape is a popular technique with many whitetail hunters. Hunter shown wearing Lost Camo. For example, early on deer hunters believed that deer scrapes were a way for does to let bucks know they were ready to breed, and were a way for mature bucks to locate these does. Hunters now know this may not be the case. We also now know that the most important element of the scrape is not the ground, but the overhanging limb, or licking branch. Research has also shown that the two most common behaviors that occur when bucks come to the deer scrape are marking the overhanging limb and rub-urination, and that nearly half the bucks that come to or near a scrape do nothing. The half that do typically smell the ground and stretch to reach the licking branch, where they lick it and/or hammer it with their antlers while rubbing it with the base of their antlers and their preorbital gland (located at the corner of the eye.) Once done with that the buck most likely will paw the scrape, bring his back knee joints together and urinate over the tarsal gland located on the inside of the knee joint. This is known as rub-urination and it is done by both sexes and can be seen all year round -- but is most prominently done by bucks at scrapes just prior to the peak of the rut. Research has also shown that dominant bucks rub-urinate more frequently than subordinate bucks do. Deer hunters have recognized for decades that there are both primary and secondary deer scrapes. The secondary deer scrapes are generally located along established travel routes, and are visited less frequently than primary deer scrapes. Primary deer scrapes, however, are the kingpin of the scrape world. These are deer scrapes made year after year, and, like signpost rubs, can sometimes be like the spokes of a wheel whereby several trails lead to the scrape. Then there is what some call tertiary scrapes, these being those random scrapes made along field edges, along old logging roads, wherever an overhanging branch might be. You may observe some deer scraping activity in September, but in the northern tier of the country peak deer scraping time occurs from the last 7-10 days of October through the first 7-10 days of November. One study conducted by an enclosure in Michigan showed that 80 percent of all deer scraping occurred before the first doe was bred. A University of Georgia Graduate student used video capable trail cameras with infrared night lighting on six scrapes that were active the previous year in two northeastern Georgia counties with a deer population of about 40/square mile. Her two-year study showed that yearling (yes, yearling) bucks visited the scrapes often in mid-October. (Didn’t we used to think that yearlings avoided scrapes?) She also found that 2 ½-year old and more mature bucks visited the scrapes most per day during the week of October 15-21, with October 8-14 in second and the first week of November third. The highest scrape visitation rates for does occurred in mid-October. 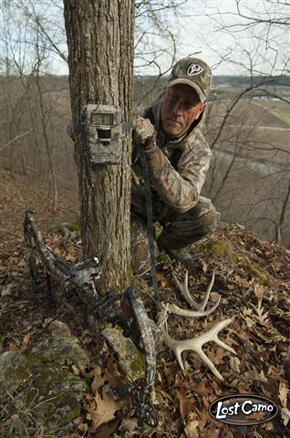 Placing a digital trail camera on or near a deer scrape is a great use of this type of scouting tool. Hunter shown wearing Lost Camo. How about time of day? A study done by a doctor in Missouri showed that most visits occur at night. His study showed the top daytime visitation periods were, in order, 8:45-10:15 a.m., 3:45-5:15 p.m., and 11:45-1:15 p.m. The student’s study showed 85 percent of buck visits and 75 percent of doe visits occurred at night. And how about this? Studies have shown that dominate bucks do not necessarily control scrapes. For example, she saw as many as 13 different bucks and as few as three using one scrape in one year. She also found that only half of the bucks revisited a scrape, though she did observe revisit the same scrape several times. It is important when building a mock scrape – or employing tools like scrape drippers – to wear rubber gloves and keep the area free from human scent. A researcher once constructed 40 artificial overhanging limbs in his pen, and 24 of them became deer scrapes within five weeks. In another test he created overhanging limbs, opened up the leaves, and also put doe in heat urine in some mock scrapes. He found that neither removing leaves nor adding deer urine increased the scraping rate by bucks. The most fascinating study on mock scrapes was conducted by two very determined doctors. From October 11-December 5 they put infrared trail cameras on four different sets of mock scrapes. One set had nothing in them, one had rutting buck urine, one had doe-in-heat urine, and one human urine. The results? Bucks visited scrapes with buck urine and human urine the most. Estrus doe urine and scrapes with no scent came in a close second. The researchers could not distinguish a statistical difference in visits to these deer scrapes, and they saw no difference in the age of bucks visiting these deer scrapes. The next fall they made mock scrapes with buck urine, hot doe urine, no scent at all, and some with “new car scent” spray. Bucks came to all four treatments. The fact that bucks came to new car scent spray and to mock scrapes with no scent was attributed to curiosity. The scientist also found that almost as many does and fawns came to the scrapes as bucks. Does came more to the doe estrus urine than the other treatments, while bucks seemed to favor the estrus urine and the buck urine. This concludes that a scrape can attract bucks based on both visual and scent signals, as well curiosity. The available research tells us that, generally speaking, deer scraping activity is most intense during the deer pre-rut period and once does begin to come into heat bucks have little use for scrapes. For those who like to hunt deer scrapes, your best chances of success will occur then. Many hunters like to use deer scrapes as a means of determining preferred travel routes frequented by bucks. Here’s a possible scenario. On the property you hunt you have identified a big primary scrape that bucks open up every year. There are several trails running to and from this scrape. Along one or more of these trails are several secondary scrapes. Each of these deer scrapes is not necessarily a killer spot in and of itself, instead delineating a single point in the line of travel. This can be a good thing. On one farm in southeastern Illinois, you can find primary deer scrapes located along a river bottom in which the wind is constantly swirling. Because of this, setting up over those deer scrapes is a fool’s game. However, some careful sleuthing turned up a line of secondary scrapes leading down into the bottom on a trail that is almost impossible to see unless you are right on top of it. By selecting a treestand site up out of the bottom but along this travel corridor, deer hunters have had good success, thanks in no small part to the fact that the wind here is easier to predict.